Room-shaking power and unprecedented low frequency extension down to 17 Hz while remaining a musical and accurate subwoofer. Featuring Ultra Series technology, the PB-2000 is driven by an unshakable 12" driver and 500W RMS, 1,100W peak power amplifier. Earth-shaking output, subterranean low frequency extension, crisp speed in transients and pinpoint control, the PB-3000 delivers reference subwoofer performance. 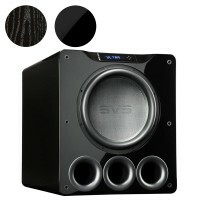 Features all-new, first-ever 13-inch high-excursion SVS driver and 800 watts RMS, 2,500+ watts peak power. The PB-4000 subwoofer thrills action movie fans and audiophiles with staggering output and subterranean deep bass extension down to 13Hz with an amazing degree of subtlety and finesse. A high-excursion 13.5 inch driver and 1,200 watts RMS, 4,000+ watts peak power. An unrelenting passion for breathtaking bass performance and engineering perfection guided every aspect of the PB16-Ultra's development. 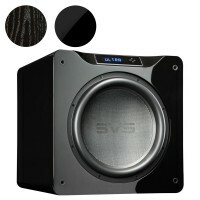 The culmination of all SVS design advancements, PB16-Ultra represents an incomparable bass experience. At first glance, it’s easy to underestimate the abilities of the SB-1000 subwoofer. But when it erupts to life with deep and hard-hitting low frequency output, there’s no mistaking it as a bona fide, high performance home theatre subwoofer. 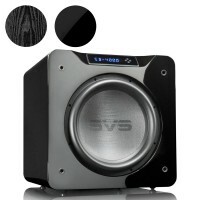 The SVS SB-2000 Subwoofer is the best-selling SVS subwoofer for its combination of effortless power, pinpoint accuracy, flawless transient response, uncompromised musicality, and intelligent processing from a relatively compact cabinet that easily integrates into any system. 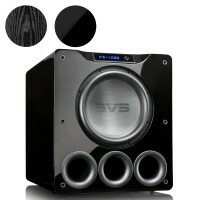 Chest-thumping output and extreme low frequency extension with stunning refinement and musicality. Measuring just over 15-inches cubed, the SB-3000 outperforms much larger subwoofers and takes command of a room sonically without taking over visually. A top choice for home theater and audiophile music systems, the SB-4000 subwoofer delivers massive SPLs and extreme low frequency extension. A high-excursion 13.5-inch driver unleashes immense sonic energy while maintaining pinpoint control and accuracy. SB16-Ultra features a massive 16" Ultra driver with astonishing 8" edge wound voice coil, a stunningly powerful 1,500 watts continuous, 5,000+ watts peak power Sledge amplifier with fully discrete MOSFET output and an innovative subwoofer control and DSP smartphone app. This new upgraded model includes a remote control for easy bass level & frequency adjustment from the comfort of your couch! 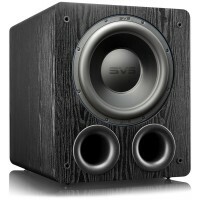 Sure to add brilliant "bottom end" bass reproduction to any home theatre or hi-fi system. A must for the serious movie buff or hi-fi enthusiast. Designed with modern lifestyle in mind the compact and stylish Sherwood Sub-8 is the ideal solution for adding bass to your sound system while not neglecting your home décor. Although the size is minimal the performance is not! Finished in premium gloss black. Sherwood Teatro 10 inch active subwoofer with 100W of power. Designed for surround sound applications and ideally matched to many of the Sherwood receivers and amplifiers, this premium black Subwoofer offers true to life sound reproduction and impressive bass. The Supernova MKVII is designed and engineered to go beyond the norm of perfection. With more patented technologies and test awards than any other subwoofer, the MKVII continues the legacy of the legendary MKVI and MKV series. Sporting a unique and innovative cylinder design with a footprint measuring just 16.5-inches in diameter, the PC-2000 subwoofer delivers unmatched bass performance per square-inch of floor space. 500 watts RMS, 1,100+ watts peak power DSP amplifier. 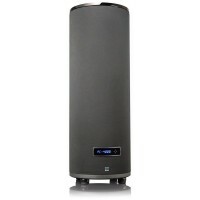 The PC-4000 is an icon of SVS design innovation standing tall as the most sophisticated cylinder subwoofer SVS has ever developed. Room-energising output and deep bass extension with less than half the floorspace required of comparable ported box subwoofers. Raijuu in Japanese mythology is the spirit of thunder. This is a symbolic characteristic of the Raijuu range of subwoofers, which are loud, fast and powerful. 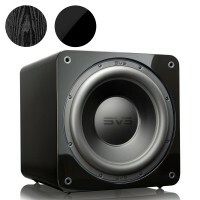 The Raijuu 2 is a compact subwoofer designed to provide maximum impact and SPL for ultimate playback of the LFE channel. Raijuu in Japanese mythology is the spirit of thunder. This is a symbolic characteristic of the Raijuu range of subwoofers, which are loud, fast and powerful. The Raijuu 2A is an active version of the compact R2 subwoofer designed to provide maximum impact and SPL.